Confederate ironclad, built at Whitehall and floated down the Neuse. Grounded and burned by Confederates in 1865. Remains one block N.
Location. 35° 15.551′ N, 77° 34.865′ W. Marker is in Kinston, North Carolina, in Lenoir County. Marker is at the intersection of South Queen Street and East King Street, on the right when traveling north on South Queen Street. Touch for map. Marker is at or near this postal address: 130 S Queen St, Kinston NC 28501, United States of America. Touch for directions. Other nearby markers. At least 8 other markers are within walking distance of this marker. 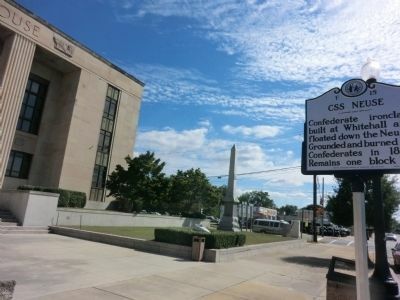 Lenoir County WW I and WW II Memorial (a few steps from this marker); Caswell (a few steps from this marker); The Town Of Kingston (within shouting distance of this marker); Harmony Hall (about 300 feet away, measured in a direct line); Kinston Hangings (about 600 feet away); CSS Neuse Confederate Ironclad Gunboat (about 600 feet away); Cat Hole (about 700 feet away); John Taylor Wood, CSN (about 700 feet away). Touch for a list and map of all markers in Kinston. More. 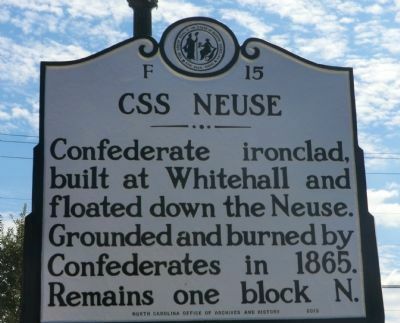 Search the internet for CSS Neuse. Credits. This page was last revised on June 16, 2016. This page originally submitted on November 27, 2013, by Don Morfe of Baltimore, Maryland. This page has been viewed 364 times since then and 5 times this year. Photos: 1, 2. submitted on November 27, 2013, by Don Morfe of Baltimore, Maryland. • Bernard Fisher was the editor who published this page.